LBSocial is a data mining website developed in Google App Engine that can extract, visualize and analyze social media data from Facebook and Twitter. If you have a Facebook account, you can use LBSocial to get your friends' posts on Facebook or public tweets on Twitter. 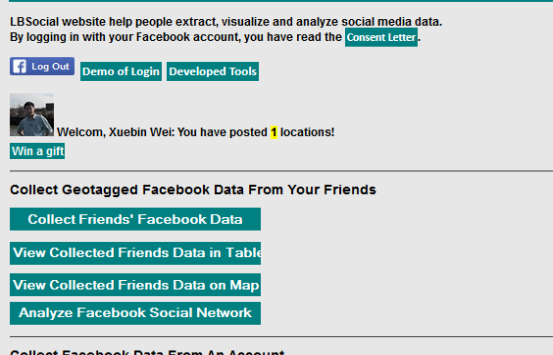 LBSocial utilizes Facebook API to extract Facebook data. Once you log in, you will see the number of places you have posted on Facebook. You can click Collect Friends' Facebook Data button, and the website will read statuses and photos of your Facebook friends', and extract the posts that contain location information. 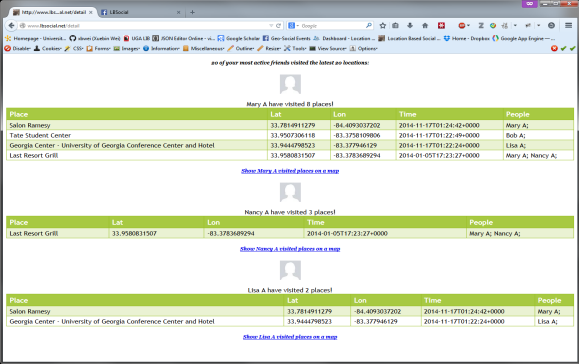 After you finish the data collection of your Facebook friends, you can click View Collected Friends Data in Table. This will give you a list of posts from your Facebook friends, including place, time, contents and participants. 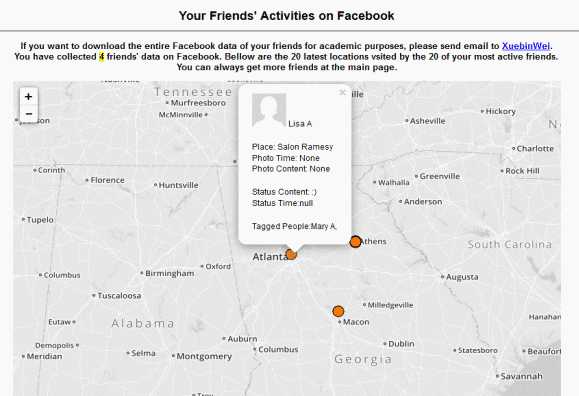 You can also view your Friends' posts interactively on a map by clicking View Collected Friends Data on Map. LBSocial uses geojson data format and leaflet to display location-based Facebook activities. 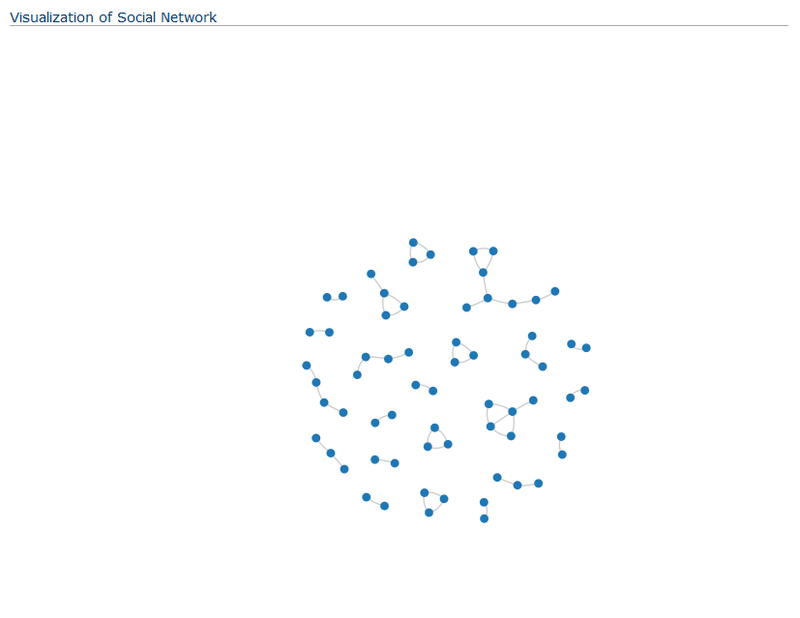 You can also see the social network of your Facebook friends by clicking Analyze Facebook Social Network. 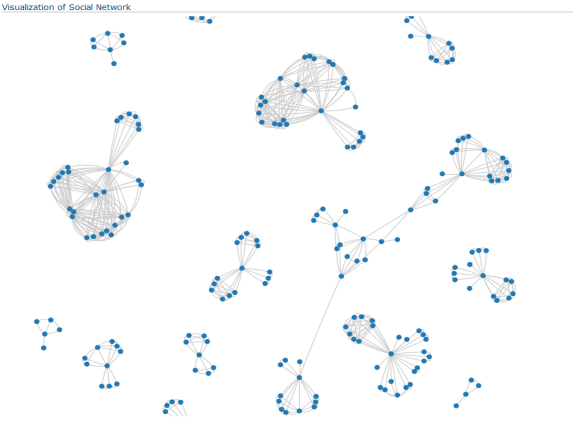 LBSocial uses networkx to construct and analyze social networks, and displays results with D3. The Collect Facebook Data From An Account function can help you to collect posts from a specific Facebook friend or a public Facebook account. LBSocial combines Twitter REST API and Twitter Search Website to harvest tweets. Type the Twitter account that you want to collect in the Twitter Account Form. You can also specify the time period that you want to harvest. LBsoical will gather a list of tweet id from Twitter Search Website based on the defined query, and then extract the tweets from the tweet id list by using REST API. 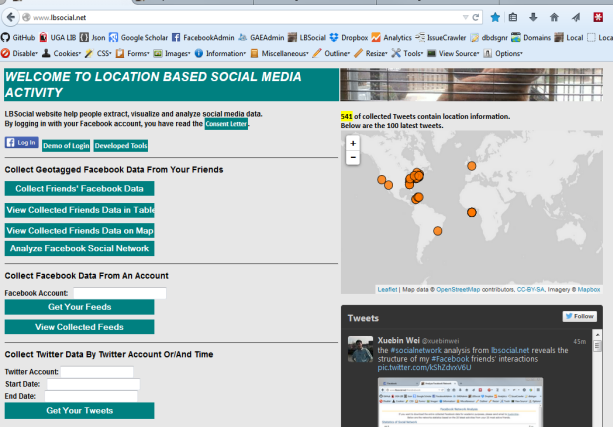 You can also collect tweets by tweet contents or by locations where tweets are published. 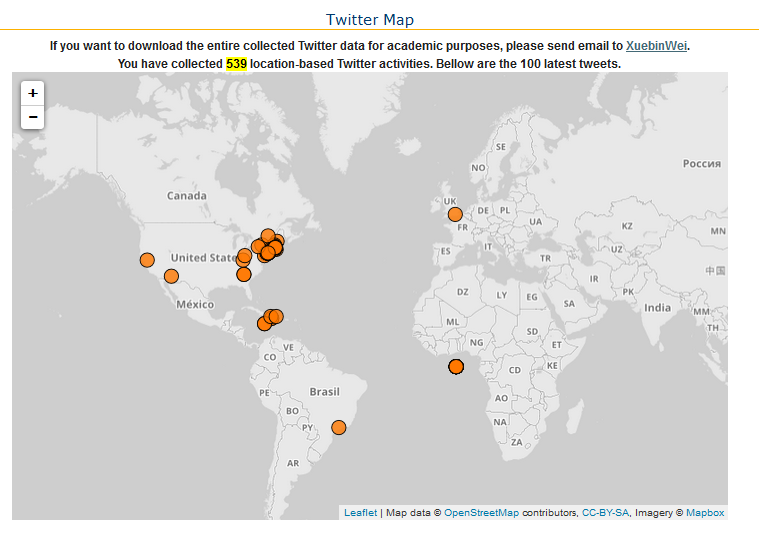 You can view the collected tweets in a table or on a map. The network analysis function will analyze and visualize the interactions of twitter users based on the collected tweets.